Randall Austin, will present “Some Honey Bee Pests and Treatments.” This is a timely discussion of varroa mite and small hive beetle management. We are entering critical months for these problems. 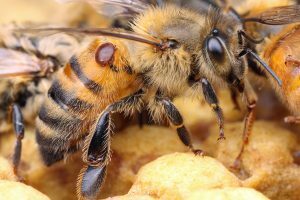 All beekeepers need to be vigilant with testing and effective treatment to assure the health and viability of their colonies throughout the summer and as the colonies move into the fall build-up stage. Strong, healthy colonies full of bees are essential to successfully overwintering your hives. Next Saturday, June 16th, at 1:00 o’clock, Randall will demonstrate the practical hands-on skills of varroa monitoring and treatment at his apiary. Plan to attend the Varroa Assessment Field Day. Contact Randall via email to get directions to his apiary. All OCBA members are welcome and encouraged to attend.